A group of Indian disciples was told to meditate like Christ. Confused, they asked their teacher, ‘How did Christ meditate?’ Teacher closed his eyes and was perfectly still for about 5 minutes. Finally, a tear fell down his face and he replied, ‘He lost himself in love.’ –By Sirqun Kaur- Spirit Voyage Blog- January 4, 2011. Meditation provides a heightened sense of spiritual awareness. It opens up the person to explore the various spiritual possibilities. In addition to spiritual growth, meditation is known to be beneficial in self-improvement and relaxation as well as health issues. When meditation is done correctly, a person can reach a profound level of spiritual ecstasy and love. Some individuals have said to me, “I would love to meditate, but I find it difficult. I either fall asleep or think of other things." These are individuals who give up easily and miss out on the wonderful blessings meditation has to offer. Yes, meditation can be difficult, at first, but not impossible. It is a matter of perseverance. The first few times I attempted to meditate, my success rate was nil. My thoughts kept jumping from one thing to another. The more I tried to focus, the harder it got. Instead of enjoying the many benefits of meditation, I viewed it as a grueling task. After several unsuccessful attempts, I realized what I was doing wrong. I was approaching it incorrectly. Instead of relaxing and letting go, I was creating a high-level anxiety shield around me. My body would get tense, and my thoughts would take a negative tone. By the end, frustration would take over; and I would immediately terminate the session. You do not need to possess magical or special powers to be successful in meditation. The key to meditation is breathing, something we have been doing since birth, but do not give much thought to. Proper breathing techniques are essential in achieving a state of relaxation and letting go. The instant I began to focus on my breathing, relaxing and letting go became a natural occurrence. My body became lighter and muscles less rigid. With each meditative session, I was able to sink deeper and deeper inside myself. The experience was exhilarating. Nowadays, I do not view meditation as an exhausting task. It has become an extremely vital part of my life. During my meditative journeys, I have gone deep into the self to face my demons and traveled to realms beyond this planet. In addition to attaining spiritual growth, I have released talents I never thought I possessed and in the process gained mental peace and freedom. Find a safe and comfortable place where you will not be disturbed. It can be the bedroom, the living room, the bathroom, etc. Do not forget to turn your cell phone off or in silent mode. Now, sit in a comfortable position with your spine straight. You can sit on a chair, bed or floor. The choice is yours. It is not recommended to perform any meditative exercises if you are hungry. The growling sound of the stomach and wandering thoughts of food will definitely interfere with accomplishing your goal. Close your eyes, and focus on your breathing. It should be smooth and natural. With each exhale, allow yourself to relax more. Exhale, let go and relax. Do this a few times or when you feel completely relaxed. Empty your mind of all mundane thoughts. 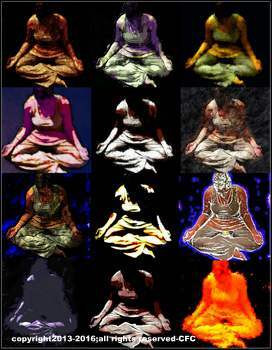 Next, visualize your body covered with a white divine light. The greater the light, the more peaceful you feel. Allow yourself and light to become one. As you continue to enjoy the warmth and love of the divine light, repeat a word(s) that has a positive meaning to you. It can be God, divine spirit, etc. The choice is yours. Go with the flow and allow yourself to embrace the energy around you. Continue this process until the end of the session. If you did not feel a sense of well being, do not worry. Tomorrow is another day. The key is not to give up.